Stepping into the shoes of a metal legend like Roy Khan is no walk in the park. 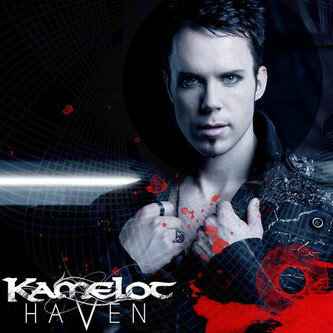 However, Swedish heartthrob Tommy Karevik is simply shining in the center of the Kamelot universe. His rise from Swedish progressive metal band Seventh Wonder to rock stardom with this iconic metal band must have been quite an adventure. From the very beginning fans and critics alike gave Tommy a warm welcome and, seeing him sing his heart out on stage with Kamelot, one can easily understand why he is the perfect choice. 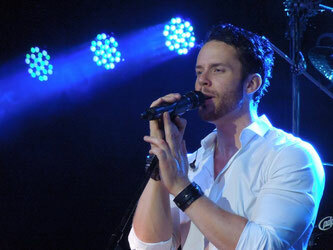 Granted, the Swedish singer doesn’t have all the attributes that made Khan such an appreciated and loved singer, but Tommy sure has a unique way of seducing the audience and making the band’s live shows more dynamic. As many fans have said, he breathed new life into the band and what really fascinates me is the way in which he manages to shed a new light on such classic songs as “Karma”, “Forever”, “March of Mephisto” or “Rule the World”. He will definitely carry on Khan’s legacy, while creating his own in this new era of the band. “Silverthorn” (2012), Kamelot’s tenth album and the first one with Tommy Karevik behind the mike, is a concept album that continues the tradition started with “Epica” (2003) and “The Black Halo” (2005). The songs tell the story of Jolee’s tragic death and its devastating consequences on her family. Lyric-wise and music-wise this album is one of the best Kamelot has ever released. Tommy’s sweet yet powerful vocals take the listener on an emotional rollercoaster. From harsh melodies (“Ashes to Ashes”) to sweet ballads (“Song for Jolee”) to power anthems (“Veritas”, “Torn”) Tommy proved that he can be just as good as his illustrious predecessor, Roy Khan. In 2015 the band unleashed their eleventh studio album, “Haven”, which is more diverse, heavier and darker than “Silverthorn”. It was my favorite release of 2015; it resonated with me so much. From the lyrical content, to the instrumental, to the vocal melodies, it just engulfed me and took me to a dark, borderline apocalyptic, world where I found peace, serenity and hope. Tommy’s voice is one of the most versatile and beautiful voices I have ever heard and I still get chills every time I hear his live rendition of “Here’s to the Fall”. You can listen to him sing and forget your worries for a few moments. With an overall dystopian theme to it, “Haven” proves that the band is in top shape and ready to take the world by storm once more, and the guys have done just that with their Haven World Tour. On October 14, 2016 they played a 70 minutes-long show in Bucharest (at Maximum Rock Festival), as part of the Haven Europe Tour Part III, and it was such a wonderful delight seeing Kamelot rocking on stage. From the first vocalizes on “Veil of Elysium” until the final “good night”, Tommy was spot on and his live voice is even better than I previously thought – so much power, control and emotion, not to mention the countless nuances of his voice and the inflections that punctuate his singing style. He’s excellent in the studio but live he’s on a whole different level, somewhere close to phenomenal. Can’t wait to see them again on their next tour through Europe. Still, if you want the full Karevik experience, dig a little deeper into his past. There you will find gold in the form of three amazing albums signed by one of Sweden’s top progressive metal bands, Seventh Wonder – “Waiting in the Wings” (2006), “Mercy Falls” (2008) and “The Great Escape” (2010). The 2006 album is a bit rough around the edges but still features some very catchy songs (“Banish the Wicked”, “Walking Tall”) and well written lyrics (“Pieces”) not to mention spectacular playing from the rest of the band (just check the bass intro for “Edge of my Blade”). 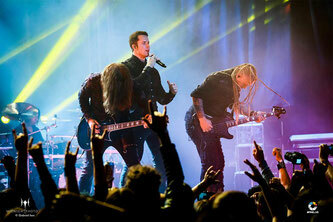 “Mercy Falls” is the concept album that took the whole progressive metal world by storm. Tommy’s singing on this is excellent, going from emotional (“Tears for a Father”, “One Last Goodbye”) to powerful (“Paradise”, “The Black Parade”) with ease. However, “The Great Escape” is my favorite album as I somehow find myself coming back again and again to the songs from this particular release (like “Move on Through”, “Wiseman” or “King of Whitewater”). Everything about this album is flawless – the instrumental is top-notch and Tommy’s vocals are simply delightful. Such songs as “Welcome to Mercy Falls”, “Inner Enemy”, “The Angelmaker”, “Taint the Sky”, or “Long Way Home” showcase his full vocal potential as well as his skills as a composer and lyricist. In 2014 the band recorded a live DVD performing “Mercy Falls” in its entirety, as well as a second concert the next morning, at ProgPower USA, and on September 23, 2016 it got released under the title “Welcome to Atlanta, live 2014”. I am trying to keep my fangirling to a minimum and be as professional as possible, but I must confess something here: I love listening to everything Tommy recorded, including the 6 Vindictiv demo songs released in 2010 under the project name Firecracker - “Born of Fire” (weird name, I know) as well as his 2012 collaboration with Pellek for “Stare into my Eyes”; I also enjoy watching youtube live videos from various Kamelot / Seventh Wonder concerts, but this… this took my breath away and my admiration for his vocal abilities to a whole new level. To be able to perform such a challenging album front to back is no easy task. His tenor voice is so powerful and delicate, soaring high above the music as he sings the lines with passion and emotion bringing forth the pain and sorrow of the characters that live in Mercy Falls. Also the second concert from this release features some incredible vocal moments that send shivers down my spine every time I watch it – “Banish the Wicked”, “Alley Cat”, “King of Whitewater”, “Edge of my Blade” but mostly the sweet acoustic “Odyssey”. I have said it time and again – Tommy shines better as a vocalist in Seventh Wonder (just give "The Promise" a listen). In 2013 Tommy was invited to sing the parts of The Prodigy on Ayreon’s concept album “The Theory of Everything”, alongside such great metal singers as Marco Hietala (Nightwish, Tarot), Cristina Scabbia (Lacuna Coil), JB (Grand Magus) or John Wetton (Asia, ex-King Crimson). The duet with Cristina, “The Prodigy’s World”, is so sweet and warm while the confrontation with Marco, “Collision”, is so angry and harsh. His back-and-forth with Michael Mills on “Alive!”, and with JB on “Transformation” show that Tommy can hold his own with professionalism and grace. The album is a wonderful sonic experience, as well as an emotional journey, and Tommy’s performance is nothing short of incredible as the touching “Inertia” or “The Note” prove it. The collaboration with Arjen Lucassen continues as he is a part of the cast for the upcoming Ayreon project, “The Source”, voicing The Opposition Leader. I can’t wait to hear what vocal epicness the both of them have recorded this time as Arjen himself said “he’s definitely showing his full potential here” (quote from Ayreon’s official Facebook page), which, until the album is released on April 28th, can be heard on both “The Day that the World Breaks Down” and “Everybody Dies”. Moreover, Tommy is one of the many talented artists and musicians that will be part of the Ayreon Universe, a trio of live shows that are taking place this September in Tilburg, The Netherlands. This has been quite a busy period for Tommy as 2017 is also the year Seventh Wonder is going to release their fifth album, and if Stefan Norgren’s recent post on the band’s official facebook page is any indication of the incredible musicianship and exquisite vocals that went into creating this album, it will be well worth the 7-year wait. 2018 will be the year Kamelot releases their new material with Tommy and I am eager to see what tunes and melodies they come up it, though still nothing about a new Kamelot live DVD. Hope some details about this surface during the summer. So there you have it: Vindictiv - Seventh Wonder - Pellek - Kamelot - Ayreon. These are the bands / projects with which Tommy has been involved since he decided to step into the limelight. At this rate in a few years we will all kneel before the prodigious Tommy Karevik and confess that he is indeed a god of metal. With such impressive vocals, stage presence, and obvious passion for music, Tommy’s journey in the spotlight is underway, may it be a long and prolific one.